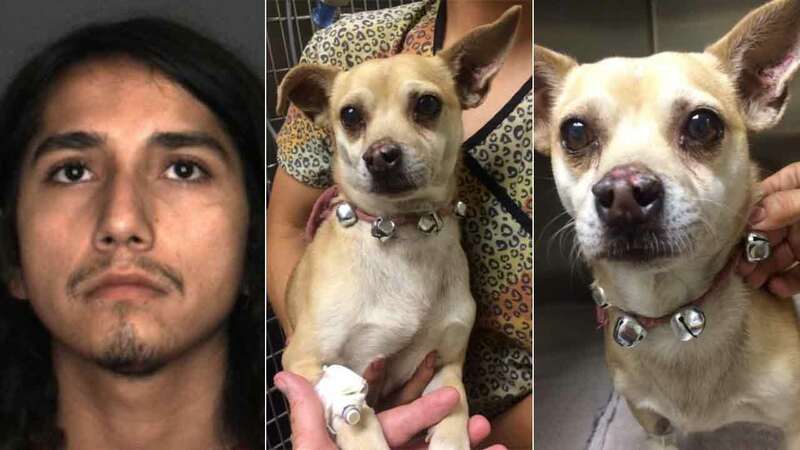 FONTANA, Calif. -- A Fontana man was arrested on suspicion of animal cruelty after police say his little Chihuahua, named Jack Sparrow, tested positive for methamphetamine. The dog's owner, 21-year-old Isaiah Nathaniel Sais, brought Jack to the Inland Valley Veterinary Specialist and Emergency Center in Upland after his dog started displaying erratic behavior. Sais told doctors that Jack may have ingested meth. Tests showed that the dog had meth in his system. Doctors said Jack was suffering from convulsions and seizures. After the test results came in, officials said Sais took Jack and left the hospital. Out of concern for the dog's life, doctors contacted the Fontana Animal Service Team and provided all of the information they had. Animal service officers went to Sais' residence in the 10400 block of Hemlock Avenue, which was the address provided to doctors at the time of check-in. At the residence, officers saw that the Chihuahua was still suffering from the effects of meth. They also saw signs of general neglect. Officers seized Jack from Sais and transported the dog back to the hospital, where he continues to recover. The case was submitted to the San Bernardino County District Attorney's Office's Animal Cruelty Task Force. An arrest warrant was issued, and Sais was arrested in the area of Foothill Boulevard and Vineyard Avenue in Rancho Cucamonga on Friday afternoon. Sais was booked into the West Valley Detention Center on a felony charge of animal cruelty. Officials said Jack will continue to recover at the hospital until he is well enough to be transported to a temporary foster home. Animal officials said Jack is currently hyper sensitive to noise and sudden movement, but he is expected to recover in time.